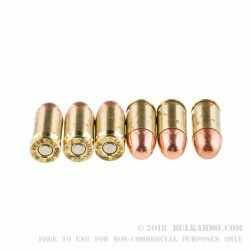 This is the ideal ammunition for range practice with a .380 Auto pistol such as a Colt Mustang, Ruger LCP, or Sig P238. The 95-grain bullet achieves velocities of about 960 feet per second, typical for .380 ACP. 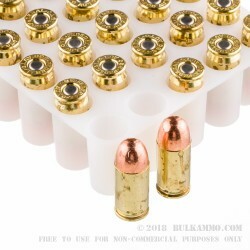 Each box holds 50 rounds in Boxer-primed reloadable brass cases. 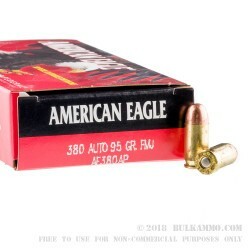 Note: According to the manufacturer's recommendation, owners of the Seecamp LWS .380 should avoid using this ammo, or any other FMJ ammo, in their guns. 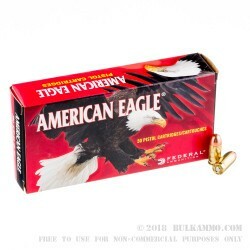 American Eagle brand ammo is economical target ammunition made by Federal Premium Ammunition, one of the most renowned ammo companies in the world. Federal was founded in 1922 by Charles L. Horn and initially used novel marketing tactics such as selling ammo in retail establishments such as grocery stores and barbershops. As the company matured, it became a serious contender in the military, police, and self-defense markets, earning the contract to produce US military ammunition at the Lake City plant in Missouri. In recent years, the company has expanded its reach even further with the Fusion hunting line and HST self-defense round. Very pleased with quickness and efficiency of how my order was handled.